So you are probably wondering what to blog about? or what to put in a blog or why someone would want to read your blog. A blog is a great way to update your website with fresh new content. For a zombie themed snack and candy company we started a blog called Ask Nurse Cody. It featured questions and answers about zombies and the apocalypse. Some questions were what to do if your friend turned into a zombie or if you were bitten by a zombie. We had a painting company blog about projects they were working on and showcased photos from those projects. You can see that maybe a topic you can write about could be. It’s not just what you say, but how you say it. It’s important for your blog to feature key words or phrases that you want to get found for. Here’s an example: I have a pie shop that specializes in organic pies. Title: It’s pumpkin pie time! Better title: It’s organic pumpkin pie time in Avila Beach. See the difference? We are using keywords and phrases so Goggle can better help identify us. The title has organic pumpkin pie and Avila Beach. In the body of the blog, you want to mention Avila Beach and organic pumpkin pie 2-3 times in the blog. That way Google knows those are the important key words. The title includes keywords like the location your business is in, product you sell, and something interesting and unique about your business. Add a blog to your website to help your rankings! 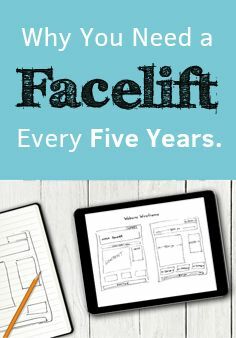 Giving your website a facelift.